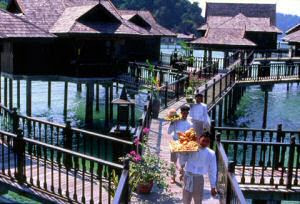 Enjoy paradise, breakfast and a massage in your private chalet above the water in the Pangkor Laut Resort Malaysia. Pangkor Laut Resort is run by YTL that is famous for its high end luxury hotels with spa and limited rooms - they also have a huge stake in the Eastern and Oriental Express train -. As with all YTL hotels, you get the best value for money to stay at Pangkor Laut Resort when ordering an all inclusive package: that includes free exotic fruit cocktails brought to you on the beach of Emerald Bay! If you just want to enjoy a massage in paradise without staying in the resort, you can take the ferry that carries passengers directly from Malaysia's mainland Lumut to the Pangkor Laut Resort Malaysia.